Here at Consulting Excellence we are acutely aware of the challenges facing executives in today's job market. We appreciate that your level of professional experience and the senior level of your target jobs requires specialist preparation. In order to meet the need of senior, top level executives we have put together a structured individual programme just for you. 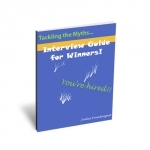 Pdf copy of our Interview Guide Ebook "Tackling the Myths - Interview Guide for Winners"
This Thomas International PPA will give you an insight into how you behave at work answering questions such as – what are your strengths and limitations? How do you communicate? What motivates you? It will help you to understand how you interact with others and raise your awareness of other individuals' working styles. The PPA is conducted online with follow up feedback and discssion taking place either by Skype, telephone or in person. Your coach will discuss with you your job search strategy helping you to develop new opportunities for targeting and accessing jobs. This will normally be conducted via Sype or telephone. We will work with you to prepare a professional, effective CV that really sells your skills and positions you at the right level. This service includes a telephone consultation during which your consultant will identify relevant information for inclusion in your CV, helping you to identify your key achievements and competencies. Based on the information you provide about your target role we will draft a high impact cover letter which can be tailored by you for other roles. During your one-to-one session your coach will work with you to match your key skills, competencies and experiences to your target roles. We will identify key question areas and work with you in developing answers that hit the right "note" with your interviewer. You will learn how to take control of the interview and how to handle those awkward questions. This is normally conducted in person but may be arranged via Skype where the client resides outside of Ireland / Dublin. To avail of these service individually would cost you €747. However we are offering you this high level programme for the unbelievable investment of €547. This represents a saving to you of over 25%. To book your Executive Job Search Programme and avail of this exceptional offer just click the Add to Cart button and process your payment via PayPal. All CVs were done to a high professional standard, delivered on time, attention to detail and excellent quality. I found the help of Consulting Excellence exceptional. Thanks for your help; I know I would not have done so well without you...The interview is completely competency based, and I know you would be ideal to advise anyone in this area. Many thanks for your excellence assistance. I found the session very helpful. I chose Consulting Excellence on the basis of our phone call last week, your web site and follow-up from my initial e-mail. Many thanks for all your hard work on my CV. It turned out much better than I could have hoped and was definitely worth the money. I will recomend your service to my friends. So now if you are ready to book your Executive Job Search Programme and avail of this excpetional offer just click the Add to Cart button and process your payment via PayPal. **Once payment has been received you will be contacted to set up your PPA and follow up sessions. If you would like to talk to us before booking your programme please submit your details below and we will call you. Otherwise please contact us at 01 4675 2391. Resume writing is possibly the biggest stumbling block for folks who are looking for a job. While it may seem simple, there are allot of subtle things that really matter. Potential employers are flooded with resumes in response to their job postings, and you only have a few short moments to make it or your resume will end up in the trash. So, how do you optimize your resume to make it likely to get read? Here are 3 great tips to get you started. 1. Be Comprehensive, yet Succinct. While your resume should contain a detailed account of your qualifications and accomplishments, you need to keep on topic specific to the job you are applying for. If you are applying for a position as an office manager, for example, you don't need to include references to your stint as a rodeo clown. The prospective employer will likely be interested only in the skills and work experience that relates directly to the position they are trying to fill. Give them what they are looking for. Take a thorough account of your work history and skillset and choose to highlight what is relevant, and eliminate or downplay the items that are irrelevant. This strategy of niche resume writing keeps your resume focused and gives you the advantage of appearing to be the most qualified candidate for the job. Kooky fonts and such may be okay for personal communications, but your resume should be more "standardized". You want it to appear as neat and tidy as... well, yourself, right? A typewritten resume using standard fonts such as Times New Roman and Arial on high quality plain white paper will be a winner every time. You also need to pay close attention to your spelling, punctuation, and grammar. Nothing would be more embarrassing than a resume with typos, grammatical errors, and misspellings. Not only embarrassing, but presenting a resume with errors will not impress potential employers and will likely land your resume in the trash can. Don't rely on computer based spelling and grammar checks. Check it yourself, and if possible, get someone else to check it for you as well. Also be wary of the reformatting that sometimes happens when you upload your resume to an Internet based resume submission service. Allot of times, you will loose your careful formatting only to find it replaced with the wrong margin, strange fonts and worse. Before you send it, check it! Your resume and cover letter should not be something that you write begrudgingly. You are excited about the job you are applying for, correct? Well, then show it! Your excitement will come across in your resume and cover letter and will impress perspective employers. Whenever it makes sense to, use action words to describe your career history and goals. To find out more about our new Interview Guide just click on the image.